Computer manufacturer Atos has named its first customer for Bull sequana, a supercomputer design it hopes will reach exaflop levels of performance by 2020. Atos is building the computer for the French Alternative Energies and Atomic Energy Commission (CEA), it said Tuesday. By targeting 2020 for delivery of an exaflop supercomputer, Atos is entering a race in which China and Japan may already have a head-start. An exaflop is a billion billion floating-point operations per second (flops). That's way more than today's fastest machine can manage: China's Tianhe-2 has a maximum performance of 33.9 petaflops (millions of billions of flops), according to the November 2015 edition of the Top500 supercomputer rankings. It's an ambitious target for Atos, as it will mean a thousand-fold increase in performance compared to the last machine it built for the CEA, the 1.25-Pflop Tera 100 completed in 2010. That machine, fast for its day, now languishes in 74th place in the Top500 list. As if that were not enough, Atos also promises that Bull sequana will be 10 times more energy-efficient than today's machines. The six-year-old Tera 100 is a laggard when it comes to energy efficiency, at just 0.23 Gflops/watt. Average power consumption across the November 2015 Top500 list was 1.45 Gflops/watt. That would put the power consumption of an exaflop machine at around 690 MW, around a third of the output of the Hoover Dam. The most efficient machines on the list, many of them delivered within the last year, performed two or three times better, with a clutch of new entrants from China delivering between 3.77 and 4.78 Gflops/watt. Modern machines, then, are already over ten times more efficient than Tera 100 -- but if Atos wants to beat the average machine by a factor of ten, it will have to build one three to four times better than today's best to meet its target, a performance improvement of 300 percent. How exactly it intends to do that is unclear. High-performance computing systems waste energy in two main ways: inside and outside the processor. Most of the waste outside the processor is in the cooling system. The sequana design is entirely liquid-cooled, giving it a PUE (power usage effectiveness) close to 1. But a PUE of 1.2 is common in data centers built in recent years, so more efficient cooling will only provide Atos with an improvement of around 20 percentage points. For the rest, it will have to focus on squeezing the most out of sequana's computing capabilities. Supercomputer manufacturers are increasingly turning to GPUs, which are perfectly adapted to the kinds of calculations typically performed by supercomputers. Graphics card manufacturer Nvidia has developed a new processor architecture it calls Pascal to speed up scientific calculations. Last week the Swiss National Supercomputing Center said it will use 4,500 of Nvidia's latest processor to triple the performance of its Piz Daint supercomputer by year-end. The machine already runs at 7.8 Pflops. If Atos can pull of something similar without increasing power consumption, it could be in with a chance of hitting its target. Rather than Nvidia, though, Atos is looking to Intel for its GPUs, or coprocessors in Intel parlance. 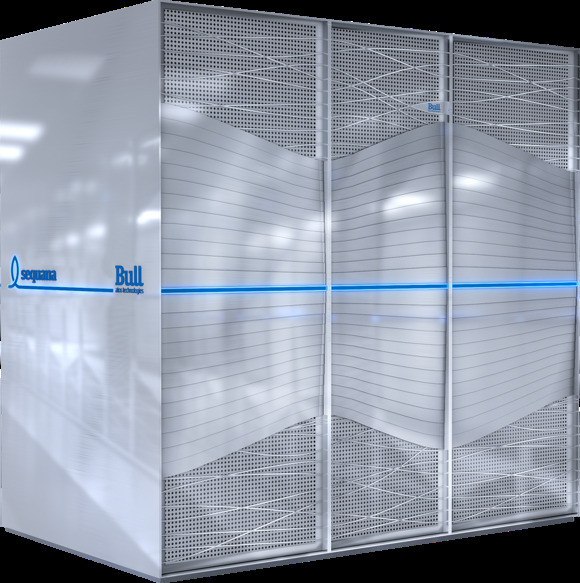 The basic unit in the Bull sequana architecture is a "cell", consisting of two full-height compute cabinets housing a total of 288 nodes, with a narrower switch cabinet between them. In early models, each node is typically either an Intel Xeon processor or Xeon Phi coprocessor. While it will take many such cells to build an exascale machine, there are plenty of businesses with lesser computing needs that might be content with one.